FANBOY PLANET.com . : mc-ultracbs :. Pearl's ready for the big time. With a tip of the hat to Cinescape, it seems that Variety reports a possibility of another comic book property making it to the small screen. Barbara Hall, creator of Joan of Arcadia, has gotten the greenlight for a pilot (not a series commitment) taken from the comic book mini-series Ultra. She will produce in conjunction with David Engel and David Alpert. Both Variety and Cinescape erroneously report this as her own comic book, when readers of Fanboy Planet know perfectly well that it's the brainchild of The Luna Brothers, the hot writer/artist team that Mario Anima interviewed about a year ago. 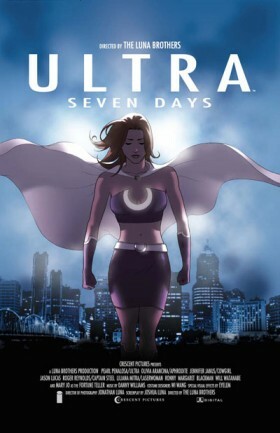 Since creating Ultra, they have gone on to the mini-series Girls and are currently drawing Spider-Woman: Origin for Marvel Comics. There. We're just giving credit where credit is due. What Variety did get right was their basic description of the series, which does sound like something that would completely catch a TV executive's ear. Variety reports it thusly: "The story revolves around a female superhero who must contend with saving the world while pursuing a life as a single girl in the city. In the comicbook, which parodies celebrity magazines, Ultra's alter ego, Pearl Penalosa, is a semi-icon who graces billboards advertising popular products." I might take issue with some of the wording, but that's just me pushing my glasses up my nose. By many accounts, Joan of Arcadia was a pretty good series that turned a little dark and uncompromising, a factor that makes Barbara Hall a pretty good TV producer in my book. And if Barbara Hall would like to talk to Fanboy Planet about her hopes for Ultra, hey, consider this an open invitation.